If you are trying to sell your products and services via your web site, you really need to know where the best place in the page is to position things. If you put the link to your sales page in the “wrong” place, for instance, you’ll miss out on sales. But where is the “right” place? Well, there’s no easy answer to that because it depends on your overall web site design and the kind of people you are targeting. Big business uses eye tracking tests plus “heatmap” analysis of web visitors. What these two measures do is tell the company’s web designers where people go on their page. They can use the data to put the most important material in the most looked at part of their page. Knowing such information is very useful for anyone engaged in Internet marketing. The problem for small businesses and independent Internet marketers is that such research is hugely expensive. However, I’ve discovered a brilliant service that provides you with heat maps and visitor tracking – free of charge…! 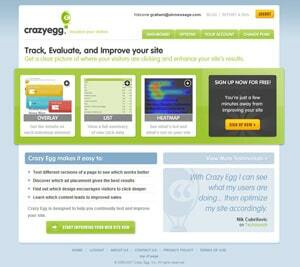 It’s called Crazy Egg and your behaviour on this page is being monitored for me….you have been warned…! Great service there Graham, pretty sure In Page analytics from Google does the same thing and that really is for free..